As I said in my post on Sardonyx, the packaging for these polishes is so cute - they have colour-matching fuzzy velvet lids and the usual shape Models Own bottle. The polishes paint on really easily - they're quite thick, but not really gloopy and they do dry really quickly, which I always love in a polish. I went for two coats because I like bold colour and no transparency, but you could get away with one if you were pushed for time! Absinthe is described as a burst of deep emerald green. 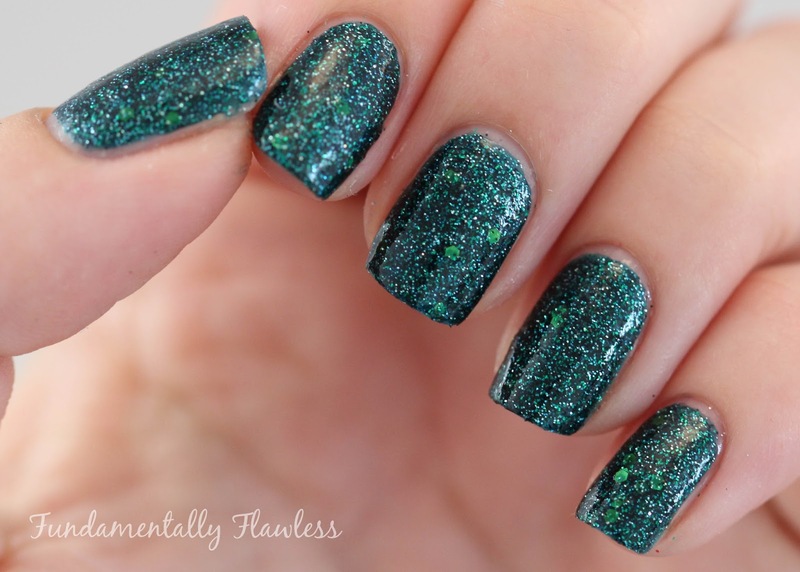 It is packed with tiny glitters - green and black in different size glitters, with some hexagonal glitter bigger than in Sardonyx - so when on the nail, the coverage is fantastic and has real depth. The polish dries matte and pretty smooth (though I wouldn't say completely). Because it's essentially a glitter polish, it's a bit of a mission to remove - I keep meaning to give the tin foil method a go! I am a huge fan of this collection - and this is a perfect colour with Christmas coming up - especially if you put a glossy top coat on it to make it really shiny (see last photo below). The Velvet Goth Collection is available for £5 each at the Models Own Bottleshops now, online from 2nd September at www.modelsownit.com, Boots from 4th September and Superdrug from 25th September. Click on these links for the swatches of the rest of the Velvet Goth Collection: Sardonyx (red), Amethyst (purple), Valerian (blue) and Obsidian (black). Do you like the look of the Velvet Goths? Which one is your favourite?